Being successful with email marketing has never been harder. Amongst a landscape of ever-increasing competition and consumers struggling to keep up with their day-to-day email inbox, you really need to maximise every aspect of the email journey to get noticed and keep your audience engaged. As a regional housebuilder, Bargate Homes relies on emails to supplement and drive customers to their Sales and Marketing suites on location. Email is used to both educate and inform their audience about the region, their product, special events and offers. MMS was tasked with increasing engagement and ultimately ensuring email activity successfully communicates core messaging. 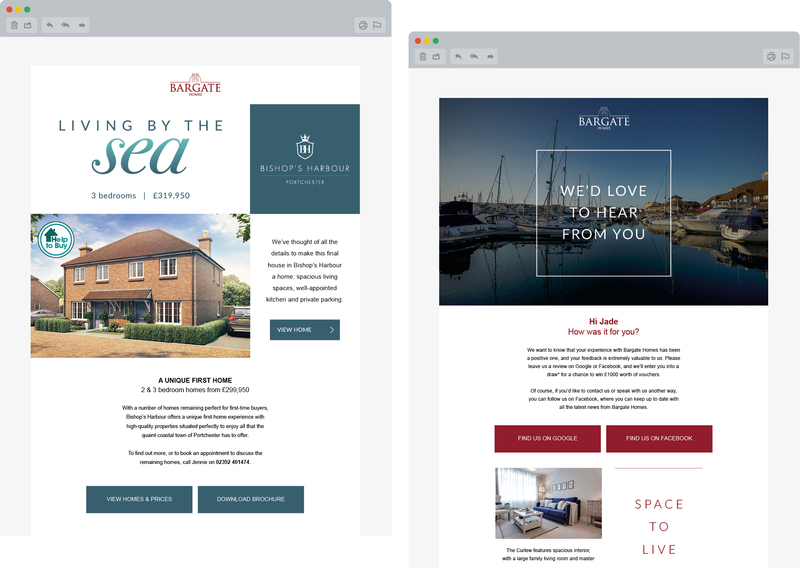 When creating individual email campaigns for Bargate Homes, we consistently select a single key variable for split testing (A/B testing), the subject line, type of image, language use, button placement or even time sent are all regularly tested. By experimenting in each individual campaign, we build a compendium of results based on what works for the client’s specific audience and implement this knowledge in all future campaigns. This ensures continual improvement across all KPI’s and delivers increased visitor numbers to the Bargate Homes website and events. Through split testing we supplied an average unique open rate of 43.7%, more than double the all industry average of 16.86%. We also provided a unique click-through rate of 38.6%, when the all industry average is a very low 5.76%.